A glimpse of my life as a Wife and a Mom. “Welcome to the Milk Mama Diaries Carnival (August). For this month, we write about the World Breastfeeding Week 2014 – Breastfeeding: A Winning Goal for Life and share how breastfeeding can help the Philippines achieve the 8 Millennium Development Goals developed by the government and the United Nations. Participants will share their thoughts, experiences, hopes and suggestions on the topic. First, let me start of by talking about the 8 Millennium Development goals. These are goals that were set by the Government and the United Nations way back 1990, and were adopted at the Millennium Summit year 2000. 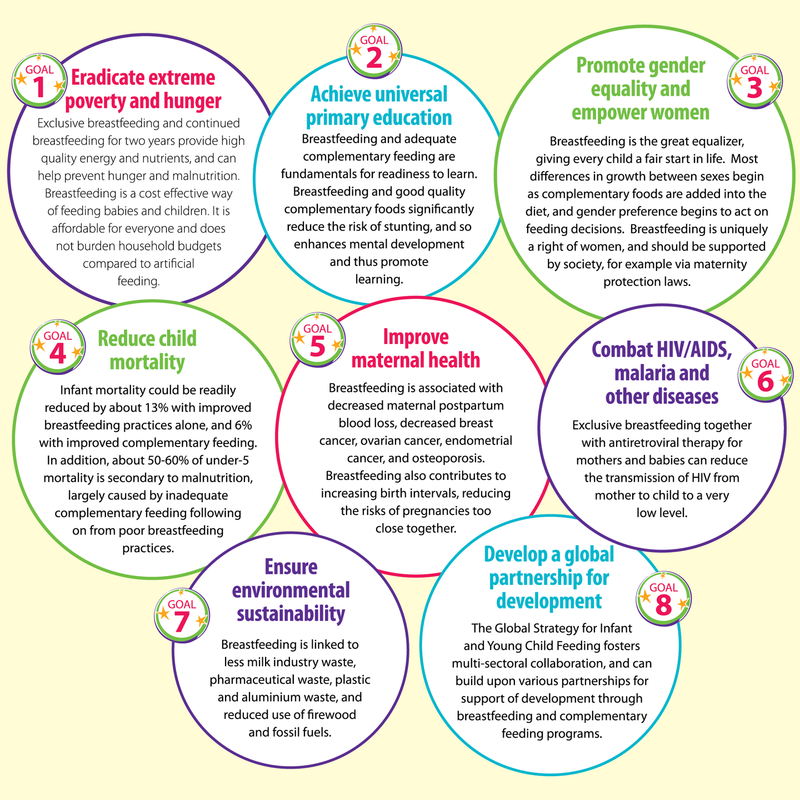 It has been proven, time and time again that Breastfeeding is a key link to achieve all these. In participation of this Blog Carnival, I will share my personal experience and suggestions on how I found these goals to be truly achievable through Breastfeeding, in order to reduce Child Mortality and improve Maternal Health by 2015 . The day I found out that I am pregnant, I immediately set my mind to thinking I should keep myself healthy in order to have a healthy baby. I was very diligent in going to monthly check-ups and in taking all that I thought I needed. Being very diligent as I have mentioned, I drank 2 glasses a day of maternity milk. 2 glasses each day for 5 months! (Why oh why did I ever fall for that again?!). First trimester passed and it was on the 5th month when I found out I had Gestational Diabetes. Since I wasn’t fond of eating sweets at that time, my IM-Endocrinologist suspected that it could have been due to the maternity milk. And true enough, she was right. It was only when I attended Arugaan’s Breastfeeding Peer Counselor Training which was held in Davao, where I learned that drinking maternity milk, or any formula milk is totally UNNECESSARY. Yes, there is no need to drink it unless you want to stuff your body with extra sugar. This also goes for follow on formula (also known as preschool milk or toddler milk). Through this training, I also learned that breastfeeding can help protect your child from the risk of cancer, obesity and DIABETES. I was 8 months pregnant then and the moment I heard of that, it was then I committed my heart and mind into breastfeeding my baby girl. Because I had a high-risk pregnancy, both my labor and delivery wasn’t easy. My blood sugar went up the charts during labor and I had to be administered with insulin throughout the delivery. If you are not aware of Gestational Diabetes, there are risks to the baby, most especially those crucial first few hours after birth. There are cases wherein the baby’s blood sugar become very low and that is really dangerous. One of the best ways to prevent that is to be able to breastfeed, right away. And that is exactly what we did as Matilda’s Pediatrician advised it as well. And because all went well, and Matilda passed all the tests, we were sent home the following day. Breastfeeding in the early weeks were challenging but rewarding as you see your baby thrive with your breastmilk alone. Witnessing how that used to be wrinkly skin slowly fill up with muscles and fats, the sight of it is just captivating. And as we were on our breastfeeding high, being able to endure the ever famous 6 crucial weeks, we got a call from the hospital saying my baby got a positive result for G6PD in her newborn screening test. Because I am very much aware about this condition, I knew at that point that breastfeeding is the ONLY way I can nourish and protect my child. One of the main components of formula milk, if you try to look at the can is soy. An ingredient that can actually pose a great harm (in large doses) to G6PD Deficient babies. I just cried and surrended it all to God. After all, I still felt very thankful to the Lord that day and until now that He gave me the chance to be informed and that He led me to breastfeeding. Had I not, Matilda, my very precious child, would have suffered the moment she was born. Breastfeeding is not only beneficial to babies but to Mothers too. I found this to be 100% true because just weeks after I had given birth, I lost a great amount of weight and I was already back to my pre-pregnancy figure 3 weeks after. Not only that, I also had to undergo a series of tests for my blood sugar and all those tests came back normal. Praise God! Just because I breastfed, Matilda got protected from possible harm and I too, got healed instantly. Again, simply because I chose to breastfeed. I believe it was all God’s work that He allowed me to experience the hardships of pregnancy, labor and delivery including those difficult early days of breastfeeding. It is through His great provision that I succeeded in this journey. Looking back, and analyzing the root of the problem, it all boils down to unethical marketing practices of formula milk companies. Imagine, it all started with me drinking maternity milk which would have eventually shifted to formula milk for my newborn baby, IF I wasn’t informed. I was very blessed to get that chance but how about those who are living in the thought that formula milk is superior to breastmilk? My goodness. What a sad reality for them to think this way and it is all because they are misinformed. One other problem I noticed is our doctors and health practitioners. How can we expect them to be knowledgeable about breastfeeding if this is not being given importance to in medical school? Universities must find a way to incorporate breastfeeding in their curriculum to turn things around. Having a breastfeeding advocate OB and Pedia (or any other doctor) will surely give any mother’s breastfeeding journey a great boost. I am also thankful we have venues like this where we can share facts and information about breastfeeding. Since these milk companies are out of our control, one of the ways we can help our country in achieving these goals is through constant spread of awareness. A little goes a loooong way when in comes to matters such as breastfeeding. Just one mom breastfeeding in public, a mom posting a breastfeeding photo, or a mother sharing breastfeeding articles over at Facebook, will really make a difference. It will make breastfeeding the norm. Another thing we can do is to continue holding seminars, trainings, equipping mothers to be able to do mother-to-mother support. This is basically the way to a successful breastfeeding journey. Breastfeeding Pinays, for example, has been such a great venue for support and it has imparted valuable knowledge to moms (even dads) which I know we have all taken to heart. Achieving the Millennium Development Goals is so much more realistic now more than ever. Take my story for example, because I was informed about the wonders of breastfeeding, we were able to provide Matilda the best nourishment there is. The only thing that will help save her life. We also cannot ignore my improved overall health as it is a testimony on how it is beneficial to mothers as well. With the help of social media and the growing community of mothers who advocate breastfeeding, I can see a future where formula milk will just be used for what is was actually created for – a supplement, always inferior and a last resort. Now I can finally say, Breastfeeding is indeed the way to a better future! Mec insists to do the Math and breastfeed! I also tried that Mama Milk. Ugh! Buti na lang I learned sooner that by eating a healthy and balanced diet is good enough to nurture Ava in my womb. I know! Super galing lang talaga ng marketing kaya it makes us think na we need it. At least now we know better! Hi Ams! Reading your story makes me realize how deeply entrenched the milk companies are. I’m reading The Politics of Breastfeeding now. Hay may golly! Let’s take the chance to inform as many people as much as we can. It always starts somewhere. If not in this generation, then Perhaps our kids’ generation. I completely agree with you Ms. Jen! I have yet to read that book pa pala. I’ve heard such good reviews about it! Shucks! Dami talaga nahuhulog regarding prenatal milk and I was one of those during my first pregnancy! Buti na lang I learned and am more informed na sa second. Hi Pat! Yes that’s true! They are very good talaga with the marketing kaya we really need to strive harder in order to spread awareness. You’re story is always a wonderful one to read! I’m part of the bandwagon of maternity milk during my first pregnancy due to parental pressures. Good thing that I didn’t do it religiously since I hated the milk and would find as many ways to avoid it as possible (one reason being the cause of my morning sickness). Oh boy – super happy that somehow I lessened that. Super galing ng story mo about conviction and definitely researching at the right time to make sure you exclusively breastfeed Matilda. I can see in her that she is reaping all the great benefits so kudos to you Mommy Ams! Thank you so much Mommy for dropping by and reading the blog! I strongly feel the need to share my story to pay it forward. A lot of people are still misinformed and through the blog I know somehow we can all make a difference. 🙂 One mommy at a time! Hay naku. I am also one of those mums who fell on that mummy milk trap. Buti na lang my officemate’s sister had gestational diabetes din nung buntis and she told me that it’s one of the reasons. Tsk! Btw, found your blog thru milk mama diaries. Saya! Buti nalang I joined. I got to find great mummy blogs too. Yay! Pick Your Pack of Crayons by Crayola for only Php 99.75!